Richard Jones (left) will be a key man for Peterborough Sports this season. 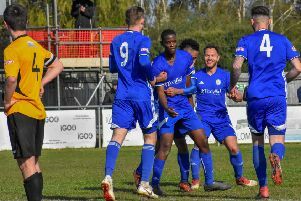 Peterborough Sports will aim to do what mighty AFC Rushdane & Diamonds couldn’t do and win the United Counties Premier Division title a season after lifting the Division One crown. All-conquering Sports - nick-named the ‘four-midables’ after winning a quartet of major trophies last season - start their competitive campaign with an FA Cup tie against Gorleston at PSL on Saturday (August 6) before making their Premier Division bow with a humdinger of a game at Wisbech next Tuesday (August 9). Sports manager Jimmy Dean said: “My chairman has set me a target of a top six finish, but I think we can do a bit better than that. “It would ne nice to think we can do what Diamonds and some other big clubs at this level couldn’t do and win back-to-back titles in different divisions. I don’t think it’s ever been done before in the UCL. Star winger Jordan Macleod is an injury doubt for Sports this weekend, while number one goalkeeper Luke McShane will definitely miss the tie. New signing Josh Bennis will step in.